NASA has released an image showing “Spiders” on Mars, small darks spots on the reddish landscape with tendrils one could easily perceive as tiny legs. The marks were captured by the NASA Mars Reconnaissance Orbiter in mid-May at Mars’ south pole during the planet’s winter season. Of course, the dark marks shown in the image above aren’t spiders – they’re not even living creatures. 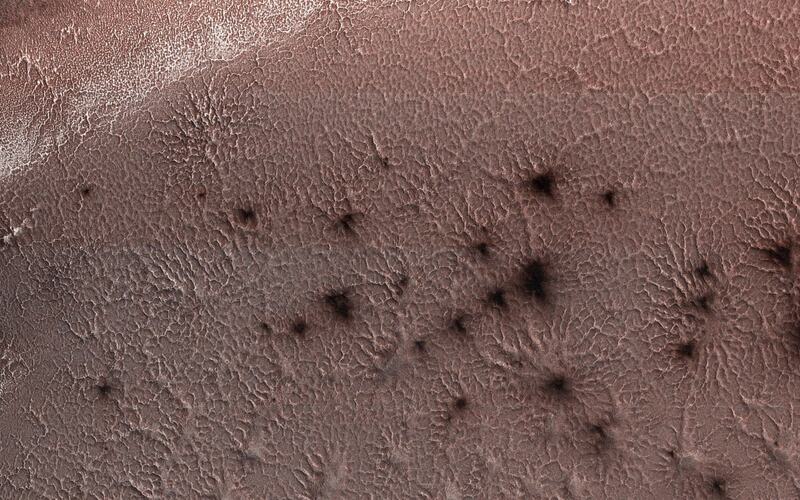 These spots form in areas where carbon dioxide ice under the surface gets warm and then releases gas. As the carbon dioxide ice under the surface warms, the gas forms but is still trapped under the planet’s surface. A jet of gas results in a dust eruption; the darker spots are dark dust that can form around the places where the gas vents. Wind, says NASA, may also blow dust that can form the “Legs” we see on the “Spiders.” Researchers explain that the features are etched into the Red Planet’s surface, leaving a fun visual imprint for researchers to examine. Arachnophobia is defined as the “Extreme or irrational fear of spiders.” But that “Fear” isn’t just limited to Earth. NASA shared a creepy image of Mars on Thursday, showing “‘spiders’ begin to emerge from the landscape” from the South Pole of Mars. The spiders are not actually eight-legged arachnids, though. MARS ‘GHOST’ DUNES MAY HAVE EVIDENCE OF ALIEN LIFE. The government space agency noted that the process is not found here on Earth and is caused when carbon dioxide ice turns from a solid into a gas. “The loss of the sublimated carbon dioxide leaves behind these spider-like features etched into the surface,” NASA explained on its website. The image was taken by the Mars Reconnaissance Orbiter on May 13, 2018, during Mars’ winter season. The Spiders from Mars might have been David Bowie’s backing band here on Earth, but that term has a different meaning when we’re talking about the actual Red Planet. NASA shared a creepy-crawly landscape view from Mars this week as part of its Image of the Day series. The scenic look at the planet’s South Pole comes from the space agency’s Mars Reconnaissance Orbiter and it shows “Spiders” emerging from the ground. The spiders are known in science circles as “Araneiform terrain.” NASA says these are “Spider-like radiating mounds that form when carbon dioxide ice below the surface heats up and releases.” The MRO captured the image on May 13 as spring was dawning on Mars. NASA goes deeper into the process behind these leggy formations: The spiders return seasonally as carbon dioxide ice morphs from a solid into a gas. That gas builds up under the surface before breaking through in jets that deposit dark dust around the vent. While Mars and Earth have a lot of crossover when it comes to landscape activity, the process that creates the spiders is not seen here on our home planet. NASA on Thursday shared an image showing many-legged shapes covering Mars’ South Pole – but the “Spiders” are less scary than you might think. The image actually shows radiating mounds that, according to NASA, form each Martian spring when the sun begins to warm the frozen carbon dioxide that forms the planet’s southern ice cap. When the carbon dioxide warms, it transitions from its solid state into a gas – but it appears to “Melt” from the bottom up, so that gas remains trapped beneath the surface. As the carbon dioxide gas expands, the mounting pressure eventually cracks through the surface, creating the veiny “Spider” formations on Mars, which are formally known as “Araneiform topography.” That’s a fancy way of saying “Spider-like,” since “Aranei” is Latin for “Spider.” The dark spots in the image are formed by dust deposited around vents where the CO2 erupts. The image was captured by NASA’s Mars Reconnaissance Orbiter on May 13 of this year using the High Resolution Imaging Science Experiment telescopic camera, or HiRISE. HiRise was built by Ball Aerospace, and has a resolution making objects as small as 3 feet in size recognizable. The fact that so much ice on Mars is formed from carbon dioxide, rather than water, is just one of the challenges facing plans to colonize the Red Planet. The Mars Reconnaissance Orbiter has previously discovered evidence of thin layers of water ice that exist beneath the surface of roughly one-third of the planet, and could be easily accessed by astronauts at certain locations.